Looking for somewhere new to dine this autumn? You’re in luck, as a whole host of interesting eateries have opened recently (or are opening soon!) across the country. Whether you fancy a casual brunch, drinks and nibbles, or a relaxed fine dining experience, here are a few new foodie hotspots to check out in Scotland. Independently owned and designed, the quirky Spiritualist is a welcome addition to Aberdeen’s food and drink scene. The beautiful bar is the perfect place to catch up over creative craft cocktails, and the contemporary restaurant focuses on local, organic produce. The menu is full of modern takes on pub grub classics, with dishes like C*ld Town beer battered Peterhead haddock with hand-cut chips alongside gourmet burgers, chunky salad bowls and hanging grilled kebab skewers. Recently opened in Edinburgh’s Newington neighbourhood, Sonder is a modern open-plan dining experience - watch the expert chefs whip up your meal from the open kitchen in the middle of the dining area. Sonder uses seasonal Scottish produce to create their inventive dishes. The minimalist menu is split into Garden, Sea and Land categories, with delicious options like cod, kohlrabi, mushroom and seaweed or beef shortrib, walnut and burnt onion to choose from. You’ll no doubt have heard about the opening of the V&A in Dundee, but did you know there’s an excellent restaurant within the new museum? Tatha Bar & Kitchen is a dining destination worthy of a visit in its own right, with spectacular views across the Tay and a menu packed full of local produce. Whether you fancy brunch with friends (the Nutella brioche French toast has definitely caught our attention…), a family-friendly lunch or a relaxed dinner date, Tatha has something for everyone. There are also light bites, sharing platters and cakes and bakes to choose from. The restaurant and terrace is open during museum hours, plus late opening Thursday to Sunday so you can enjoy dinner at the weekends. 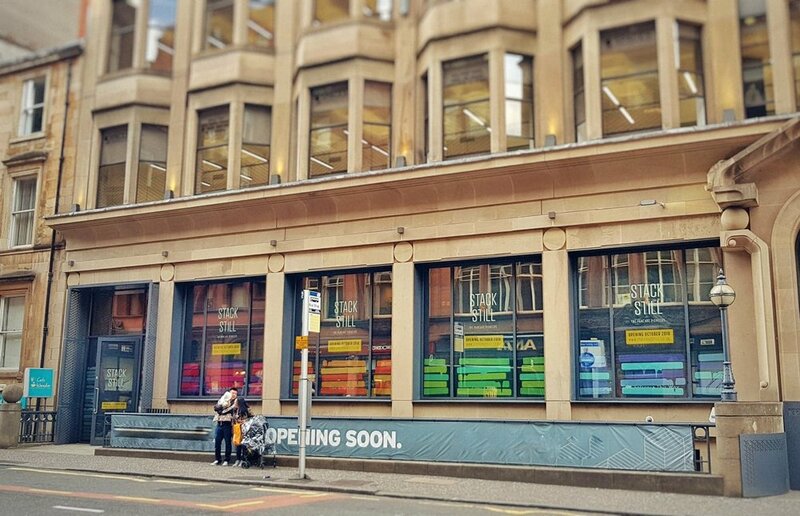 The UK’s biggest pancake house, Stack & Still, is about to open in Glasgow. Promising a whopping 12 million combinations (we dare you to try them all), the menu is full of every type of pancake, sauce and topping your heart could possibly desire. Open every day from 8am to 1am (from mid-October), Stack & Still hopes to become an integral part of the city centre for all-day dining. In addition to the create-your-own pancake menu and both savoury and sweet signature stacks, the restaurant will also be home to Glasgow’s first self-dispense bar with beer, ale, cider and prosecco on tap. Tom Kitchin is one of Scotland’s top chefs, with a Michelin-starred restaurant by Leith’s Shore, a fine dining eatery on Castle Terrace, and a much-loved gastropub, the Scran & Scallie, in Stockbridge. He’s set to open his fourth Edinburgh restaurant this autumn - Southside Scran in Bruntsfield. Due to open in November, Southside Scran will have a relaxed bistro feel, with a theatrical rotisserie in the middle of the open-plan dining area. As you’d expect from Tom Kitchin, the menu will have a very seasonal Scottish focus, but with hints of French flavour. Although full details are still under wraps, we’re very much looking forward to the launch of So L.A. later this autumn. The new restaurant and bar comes from Rusk & Rusk, the team behind favourites like The Spanish Butcher, Hutchesons and The Butchershop Bar & Grill. We predict this will quickly become the most Instgrammed restaurant in Glasgow - in fact, So L.A. are even inviting new staff to apply by posting photos on social media. The restaurant will encourage diners to “live life to a Pacific beat” with a menu inspired by California cool. Scotts are already a well known name on the west coast, with restaurants in Troon and Largs, but now they’re venturing east with the opening of Scotts Bar & Restaurant in South Queensferry. With stunning views of the Forth bridges and atmospheric luxe-industrial interiors, it’s the perfect place for a special date night. Scotts specialise in fresh seafood, so you’ll find dishes like garlic and herb Troon Bay langoustine and east coast whole lemon sole on the menu, in addition to mouthwatering grilled steaks, seafood sharing platters and classic crowd-pleasers. For authentic Indian street food in bite-sized portions, visit the new Mumbai Street Food restaurant in Leith. The menu features an array of tapas-style plates, so we’d recommend visiting with a few friends to swap, share and try as much of the menu as possible. As well as familiar curries, grills and bhajis, you’ll also be able to tuck into more unusual options. Keep an eye out for dishes like spicy masala squid rings, dahi balle dumplings dipped in yogurt and tamarind chutney, and kathi roll filled flatbreads.